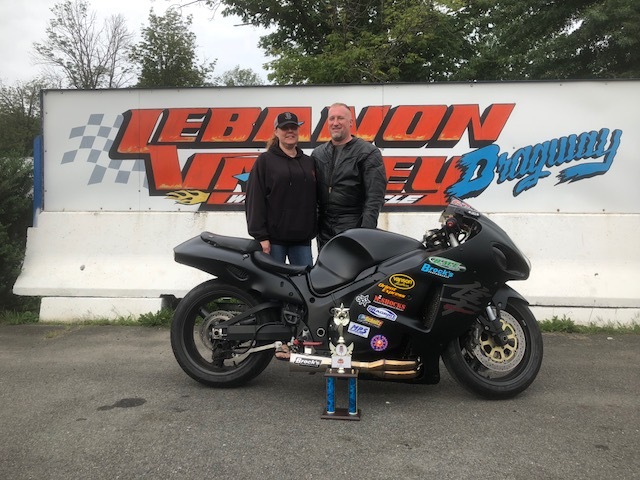 Cooler weather and fast time slips greeted the racers this Saturday at Lebanon Valley Dragway. 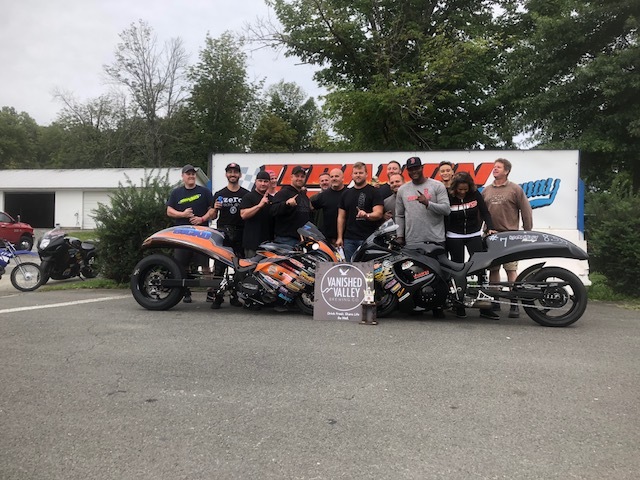 Ed Johnson was the first one to grab some cash when he nabbed the #1 qualifier money that was posted by Worldwide Bearings in the M2 Shocks Street Class with his perfect 000 reaction time! 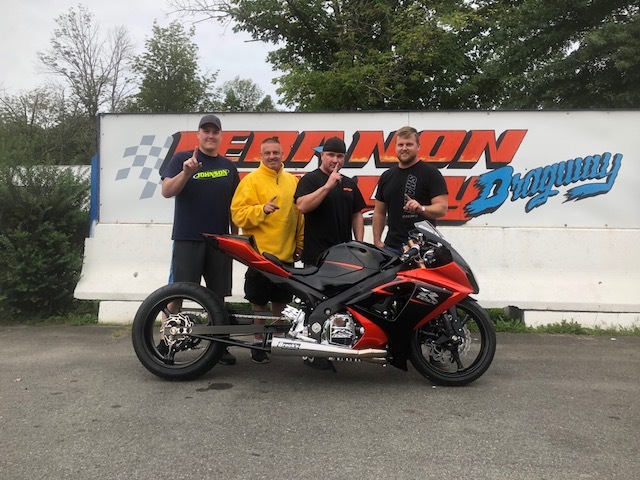 He was not able to maintain that pace on the reaction timer and was picked off in round one of eliminations by Louie Supczak. “Doctor Jeff Tisdale” was the next racer to cash in when he grabbed the #1 qualifier money in Vanson Leathers Pro that was posted by MTC. He did it with a 001 light! He managed to go three rounds in eliminations before red lighting to Ben Knight. 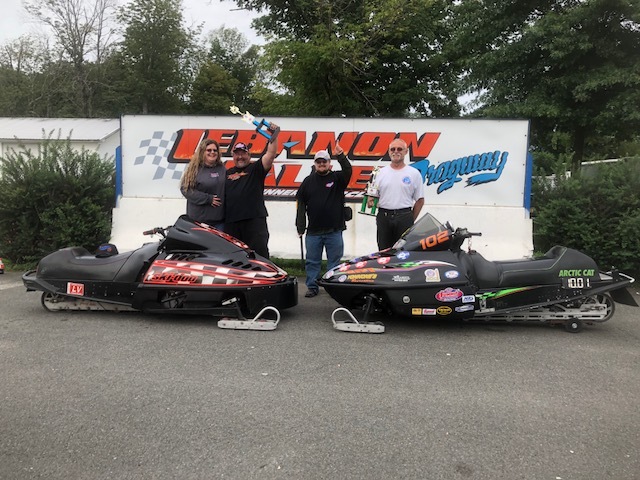 By the way, Jeff had a pretty good day doing double duty driving his dragster as well, he won the Electronics Gamblers race! 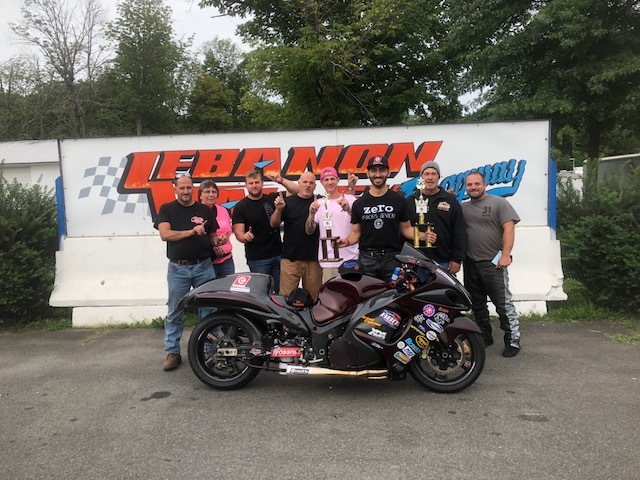 Vantine Nitrosports and Vanish Valley Brewing Company from Ludlow Mass posted the #1 qualifier money in the DME 9Below class and it was taken by Justin Shaker. He ran a 7.688 e.t. Not only was that number good enough for the cash for the quickest qualifier spot, nobody ran faster than that all day. Although Justin’s day started out on a good note, he had to borrow a bike from Curtis Thorington to run in the eliminations rounds. Justin must have liked that bike, he rode it all the way to the runner-up spot! 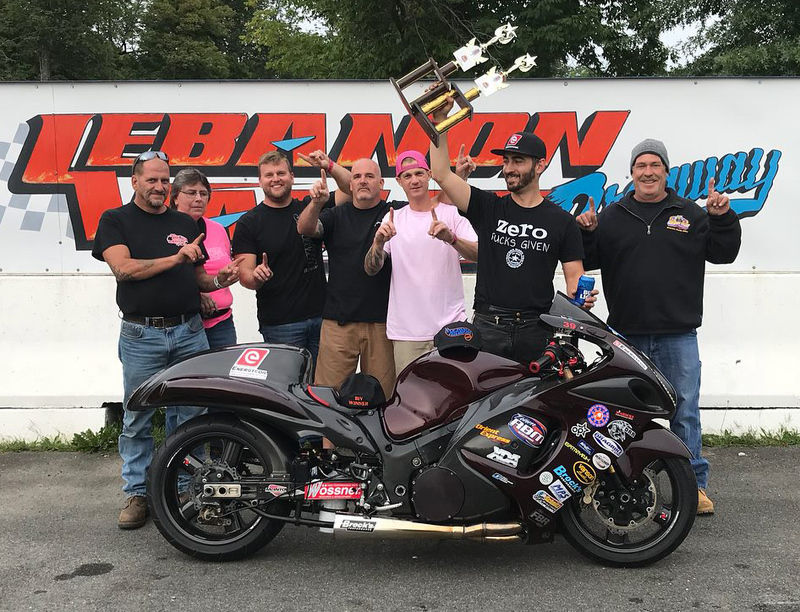 Eliminations began with M2 Shocks Street, Ben Knight got to the final with a chance at a trifecta because as he staged the bike for the final round he was still in contention in all three classes. He was able to seal the deal when Adam Sheran went red! Ben had good reaction times all day. His lights were 040, 029, 019, 018, and 035! That is an average of 028! Adam had been pretty sharp on the tree most of the day himself. He had lights of 046, 079, 021, and 006 before the red light in the final. The best reaction time of eliminations in this class was run by Michael Ducharme who had had a 002 in round one. 21 bikes entered DME 9Below. The final came down to Justin Shaker on Curtis Thorington’s bike as mentioned earlier and Ben Knight. Ben was able to capture the second piece of the trifecta when he had a much better reaction time than Justin. Ben ran 8.86 on his 8.84 dial. Justin ran way under his dial while trying to catch up. He ran 8.47 on his 8.53 dial and still could not catch Ben. The best reaction time of eliminations in this class was in round one when Brian Propper had a 012. 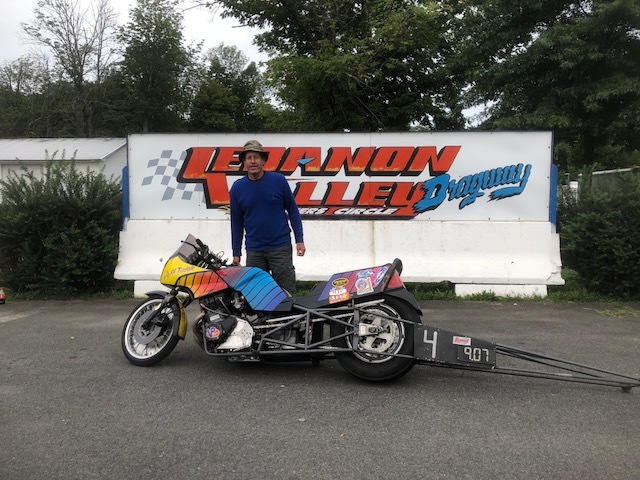 Vanson Leathers Pro needed six tough rounds to see who would come out on top. Just after winning his second class in a row, Ben Knight was getting ready to run in the semi finals. If he was going to get his third win of the day he would have to beat two sleds in a row. Darrell Aubin had the bye run, so he would just take the tree and race the winner of Ben and Dave Ferguson. Ben had a slightly better light than Dave, but took a bit too much stripe and sent Dave to the final for the first all sled final in Vanson Leathers Pro. The final pitted Dave’s 1995 Arctic Cat against Darrell’s 1995 SkiDoo. Neither rider had great reaction times, but they were close with Dave holding an 8 thousandths of a second advantage. Dave could only run a 10.37 on his 10.01 dial while Darrell was running almost right on his dial with a 10.56 on his 10.54 for the win! 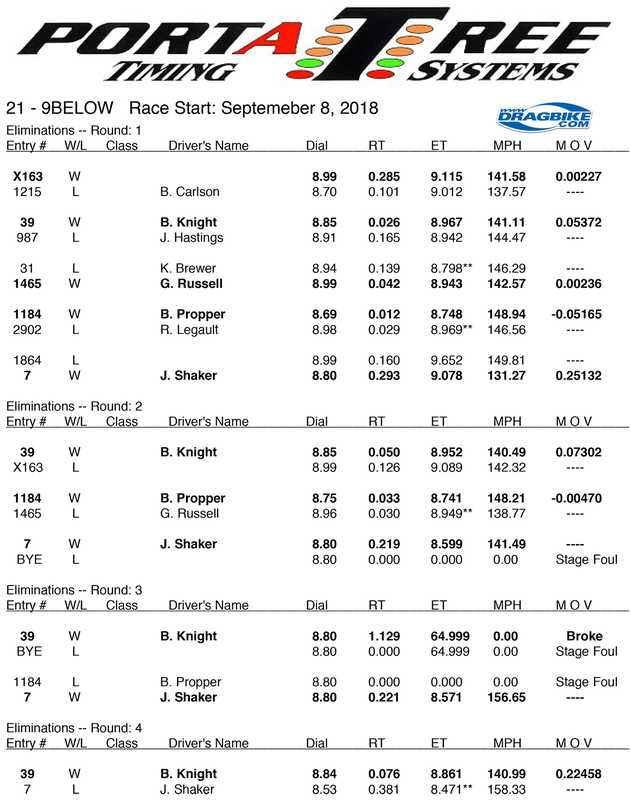 Ben Knight had the best reaction time in eliminations with a 000 in round two. Thank you to all of the sponsors and all of the racers for putting on a great show!